What is the ending inventory? 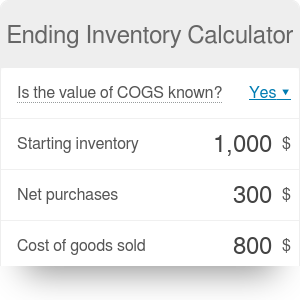 This ending inventory calculator will help you determine what is the total value of units in your inventory at the end of an accounting period. Thanks to this tool, you will be able to quickly and effortlessly figure out how to calculate the ending inventory value that goes into your balance sheet. You will also be able to calculate your inventory turnover to measure how efficiently you are selling your product. If you want to discover what is the ending inventory formula, simply keep reading! Make sure to check out the margin calculator, too! If you happen to sell any products, you will probably be left with some of the product in stock at the end of the accounting period. These products have a certain value, called the ending inventory. The most straightforward way to calculate the ending inventory is to conduct a physical count. This, however, is not always possible; it may be far too time- and labor-consuming, or you might be too busy shipping products at the end of the month to perform an actual count. Then, the best method is the analytical one - to deduce the ending inventory from your beginning inventory, the cost of goods sold, and net monthly purchases. Cost of goods sold, or COGS, is the direct cost of production of goods that you sell out of the materials from the inventory. Remember that there is no one optimal inventory turnover value. Even though high values are preferable, they may signal that the inventory levels are low during the month, what can cause difficulties with providing your product to customers on a short notice. Start with determining your beginning inventory. Let's assume that at the beginning of the month you had $25,000 worth of materials in stock. Determine the net value of purchases made over the month. Let's say it was $30,000. Find out what was the cost of producing the goods you sold during this month. We can assume it was equal to $40,000. Your inventory turnover is equal to 2. It means that you have sold the equivalent of your average inventory twice during the accounting period. Ending Inventory Calculator can be embedded on your website to enrich the content you wrote and make it easier for your visitors to understand your message.